On today's program we will be getting into it with two members of the Prophecy Forum (www.theprophecyforum.com). Their names are Doug Woodward (www.faith-happens.com) and Gary Winkleman. Today they are joining Dan Duval to get into it on the subjects of Russia, geopolitics, and Bible prophecy. This is a no holds barred conversation as they get into Putin's masterplan, Netanyahu's recent speech to Congress, the Middle East, and New World Order Agendas. With so many fascinating ... See More subjects to tackle the fun doesn't stop. Gary's unique perspective, as an ex-patriot spending time in Russia back in the 90's, adds a lot to the discussion. Doug and Gary are also announcing the release of their new DVD set. 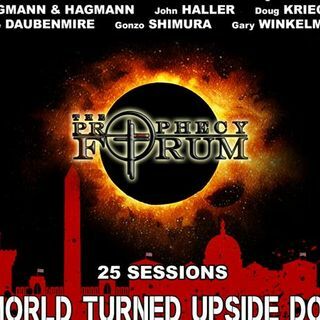 The Prophecy Forum organized a conference in Dublin, OH late last year called "A World Turned Upside Down". A number of speakers and authors on end times subjects, including Dan Duval, were present at this conference. You will find all of the action on the 14 DVD set, which is available at www.theprophecyforum.com.